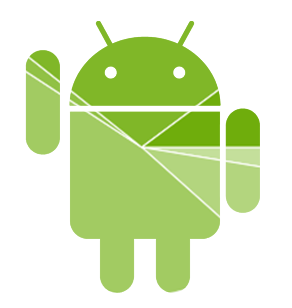 The long, hard road towards the future of Android slogs on. While Gingerbread still remains the largest major version of the platform, its dominance is decreasing steadily. 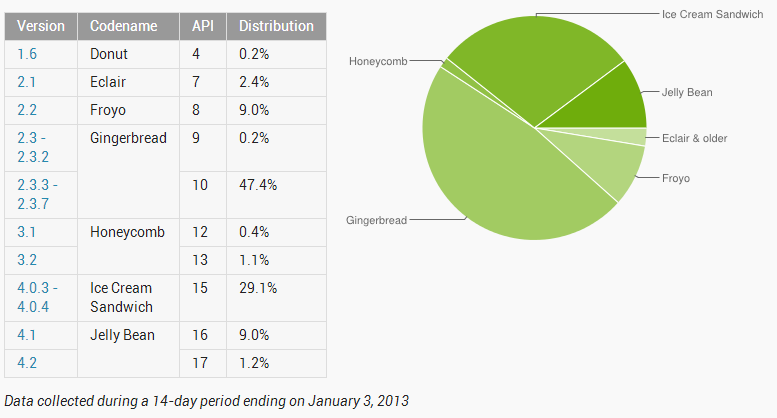 As of January 3rd, Gingerbread only represented 47.4% (down from 50.6% in December)of all Android devices. The second runner-up was Ice Cream Sandwich with 29.1% (up from 27.5% in December). The two versions of Jelly Bean totaled up to 10.2%, though if you subdivide by the Summer and Winter releases, they get much farther apart: 4.1 accounts for 9%, while 4.2 is on a measly 1.2% of devices. The decrease in Gingerbread and increase in Ice Cream Sandwich is good enough news, especially since 4.0 saw the advent of the much more modern UI that has remained fairly consistent throughout subsequent platform releases. Still, it's January 2013. Gingerbread was released in December of 2010. It's now past two years since 2.3 was unveiled, and over 14 months since the advent of 4.0. This clearly isn't an optimal roll out schedule. As encouraging as it is to see ICS land on more handsets, we have to really hope that Google has better plans to fix this problem. The early-release PDK doesn't seem to be helping too much.